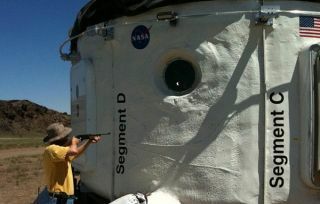 An air rifle is used to test the NASA Habitat Demonstration Unit. Detecting the sounds of damage aboard spacecraft could help avert disasters, researchers suggest. Astronauts face not only a deadly vacuum, perilous radiation and extreme temperatures in outer space but also a shooting range-like environment where tiny projectiles zip around in low-Earth orbit 20 times faster than a speeding bullet. About half of these whizzing objects are debris from spacecraft, while the rest are tiny meteoroids. Orbital debris larger than about 4 inches (10 cm) are rare and can be tracked from Earth and avoided. However, smaller objects cannot be seen from the ground and are very common, with 100 tons of micrometeoroids colliding with the planet daily. These hyper-fast projectiles are dangerous, often blasting holes 10 to 20 times their size. Although living areas and critical systems on spacecraft are protected with shields against such harm, not all surfaces get properly defended due to weight limitations. As such, researchers are developing devices to alert astronauts when and where damaging impacts occur. The idea is simple. When a collision occurs in space, it makes a rather loud sound, generating an acoustic wave in a wall that can be detected tens of feet away by sensors on the walls. These postage-stamp-size devices are made with a very sensitive piezoelectric material that generates a charge proportional to the level of vibration they experience. These sensors can be used to calculate the energy of an impact as well as its location, with a range of about six feet (2 meters) on fabric or foil shields to about 165 feet (50 meters) on aluminum walls. "An acoustic sensor can detect impacts from particles down to 5 microns or so," Giovane told InnovationNewsDaily. The scientists recently tested these devices on the NASA Habitat Demonstration Unit during the 2010 Desert Research and Technology Studies (D-RATS) last autumn in northern Arizona. The network of sensors collected background acoustic data during normal crew activities, and an air rifle was regularly fired at the wall of the habitat to simulate impacts. The sensors identified all 147 impacts, narrowing the location of each to within 3 inches (8 cm), which is much higher accuracy than needed during operations. False signals from electrical spikes caused by the habitat power generator or from noisy crew activities near the sensors could be weeded out by judging their duration or energy levels. The researchers are now readying an improved, fully automated system for the next set of tests scheduled for late September. They are also exploring sensors that can provide additional details about projectiles involved in impacts, such as their velocity and mass. The team hopes that scientists can use this data to determine the risks that other spacecraft flying into a given orbit might face. The scientists detailed their findings May 26 at the Acoustical Society of America meeting in Seattle. This story was provided by InnovationNewsDaily, a sister site to SPACE.com.Follow InnovationNewsDaily on Twitter @News_Innovation, or on Facebook.